In the summer of 2017 I created five hair meshes with the intent of implementing them in some of my favorite games, including Fallout 4, Fallout: New Vegas, and Oblivion. I had always loved making my RPG characters look pretty, and in fact the first mod I ever downloaded was a hairstyle mod. After I completed my first year in college learning 3D modeling, I tried my hand in creating five hairstyles I imagined. No tutorials for what I was exactly attempting existed, but with some trial and error and many hours, I created my first hairstyle, named "Aza", after one of my first Oblivion characters. After each hair was made, I would port it to Fallout 4 to test and screenshot, then move unto my next. When these five were done, I released my mod on Nexusmods and then Bethesda.net for PC and Xbox One. Here is some of the references I looked at, as well as some drawings I did of my Fallout 4 character (lavender hair) before the game even came out. In fact, the limited customization of Fallout 4 was why I began modding in the first place, so that I could get my character to look more like my concept art of her. 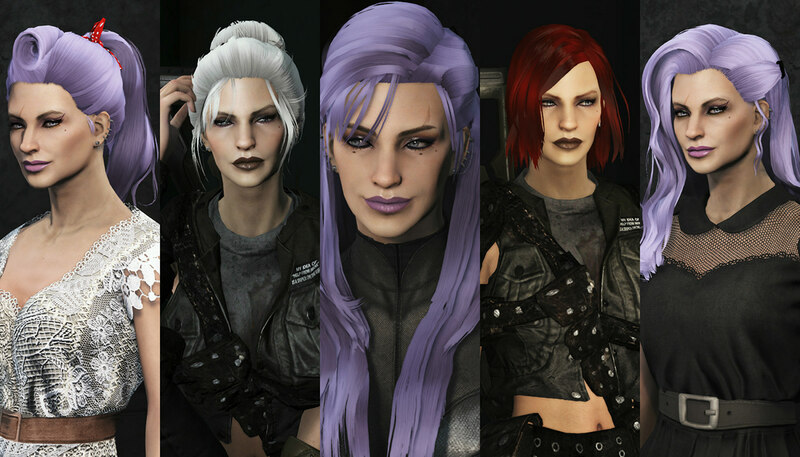 Here is the original five hairstyles I made, in Fallout 4. I soon after ported my hairstyles into The Elder Scrolls IV: Oblivion, my favorite game of all time. Shortly after releasing my hairstyles for Fallout 4, and fellow mod creator offered to port my hairstyles to Fallout: New Vegas. This is the geometry of "Zella Ponytail," the third and most difficult to make of the hairs. I wasn't prepared for exactly how hard it would be to make the hair roll. To make the hair meshes, each strand I would create a live curve in Maya on a similar shaped hairstyle model, make the second curve, rebuild the curves, and loft them. The textures had many uv shells stacks on locks of hair, I made these from scratch as well. 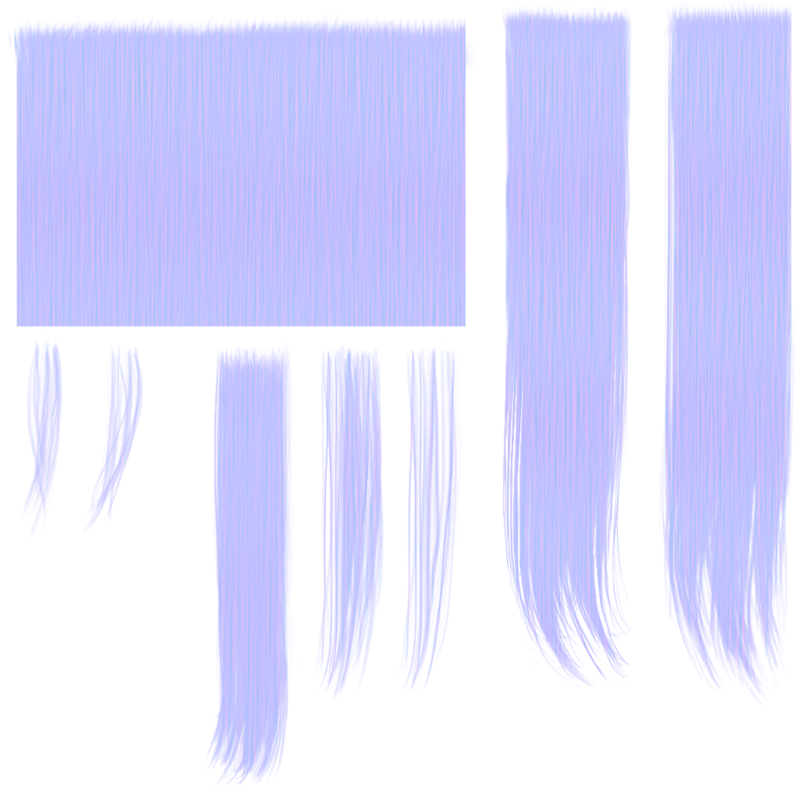 The hairs took 25 - 12 hours to model each and additional hours to convert to each game. After modeling the hair and making the texture, I would convert the .obj into .nif in 3DS Max, the mesh type that works in Bethesda games. Then, I'd dig into my modder's tools. I'd weight the cloth bones in Outfit Studio, a popular modder's tool for editing meshes in Bethesda games. After that I'd link up the material files, which make the textures work, and create/edit an .esp, which is a plugin that makes mods appear in a game. 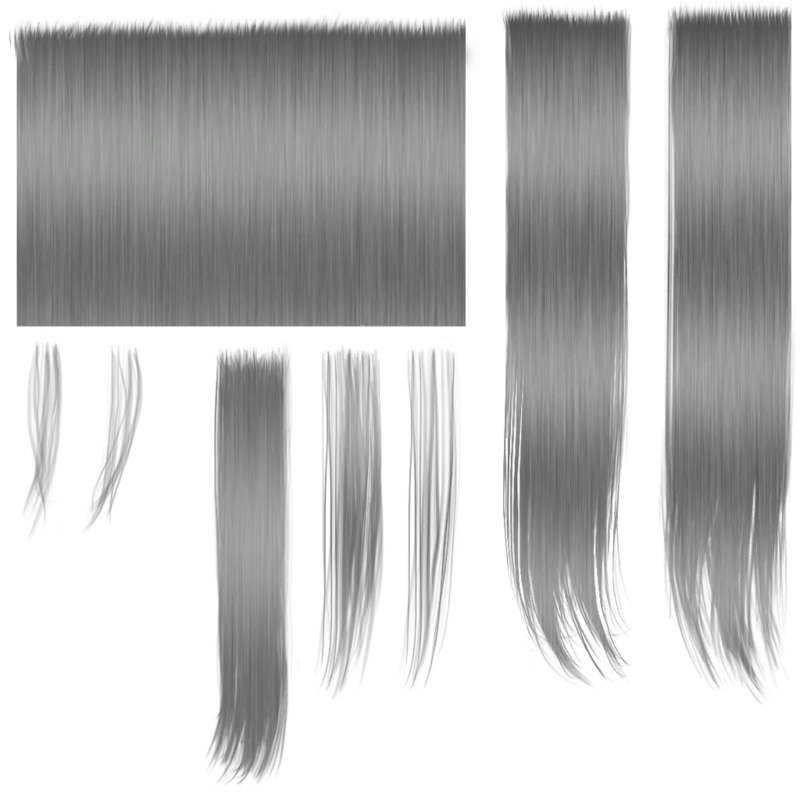 These are the grayscale diffuse and normal maps of Zella Ponytail. I used brushes and blur techniques in Photoshop to make the hair textures. An additional feature I learned with creating this mod was making the hairstyles so they wouldn't clip through hats. A previous mod I worked on, which ported 300 custom hairstyles from Skyrim to Fallout 4 did not have this feature as it was too difficult to apply to each hair. That mod is the biggest I've worked on, and the process of creating it provided a good portion of the skill and knowledge I needed to make this one. That includes converting them to be game compatible, and weighting the hairs so that they'd have physics and move with the character. This sixth hairstyle I created in October 2017. Overall, this project is the one I am most proud of. It was a goal I set out to do years in advance and that I achieved pretty decently. In addition to meeting my goal, I had over a hundred thousand people appreciate my work as well. 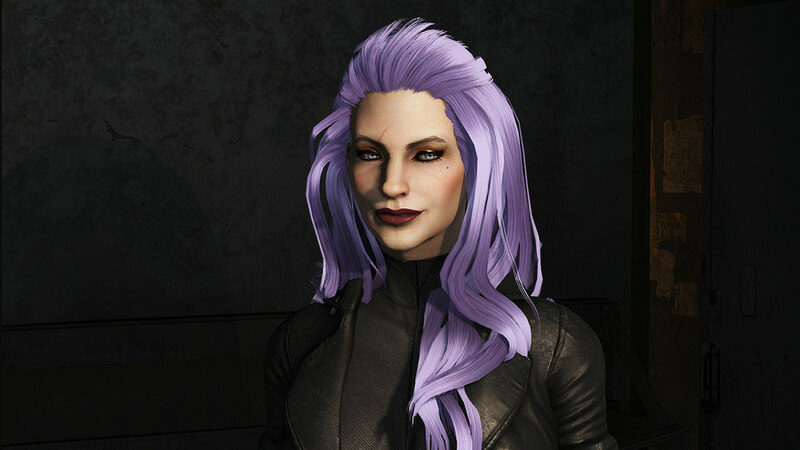 Seeing other people's characters wear my hairstyles is something I only dreamed about a few years before. These five images are from the user share area of my Nexusmods pages. Credit to the screenshot takers. In the summer of 2017 I created five hair meshes with the intent of implementing them in some of my favorite games, including Fallout 4, Fallout: New Vegas, and Oblivion.